It's always nice to tick something off the list isn't it? I'm sure you know the list I'm talking about, it's the one that's added to far quicker than you can possibly keep up with, or even probably complete in a lifetime. Yep, it's the ever growing 'Crafty Things I Want to Make One Day' list. These hangers have been on my version of that list for ages and ages. Probably since I bought this Japanese Crochet book from Pomadour's Craft Cafe on Etsy, which contains, amongst the many, many pretty things, some cute as a button coat hanger covers. I think one of the main stumbling blocks on my path to hanger happiness was sourcing those particular style of vintage look hangers. A quick search previously had not revealed the kind of hanger I wanted and the idea got pushed further down the list, as these things tend to do when you can't act of them straight away. 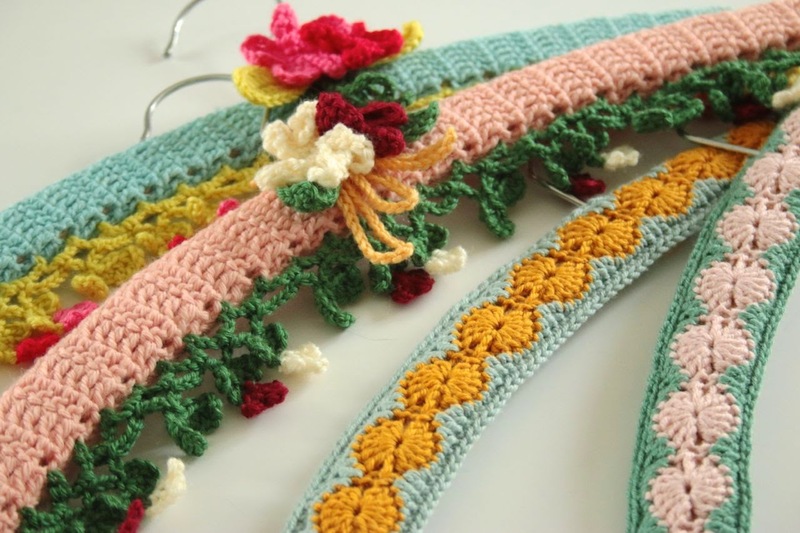 Then somewhere along the way I discovered that I had one lonely hanger of the right shape and after seeing yet more crocheted covers in a recent magazine, I pulled out the book again with renewed enthusiasm. Of course, you can't stop at one with these things, or at least I can't, so I determined to find more of the 'right sort' of hangers straight away. I think that fate approved of my idea and so decided to throw a handy coincidence my way. After an enjoyable meeting with my friend in crochet, the lovely Sam of Betsy Makes, I learnt that she too has the book (in English!) and was in the process of making herself the exact same hanger covers. Sam got her hangers from Dunelm Mill so I was all set to go and get some myself, but being an impatient sort, I decided to go internet hunting again and this time, tracked them down. 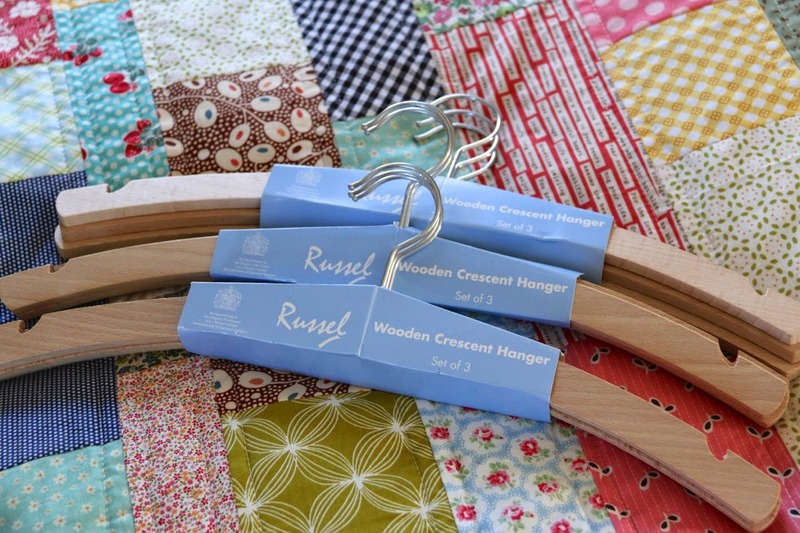 It turns out that 'Crescent Hangers' is the search term you want for successful crochet cover suitable hanger shopping! Armed with lots of naked hangers, I set about covering them up and that's what's been keeping me occupied this past half-term. That and the usual holiday business of ensuring that Little Miss is entertained from dawn to dusk of course. Pleasingly this is another 'using up the yarn scraps' type of project as you don't need too much yardage to cover a hanger and even less for all the dangly whatnots. It took me a little while to work out what yarn I should be using, the disadvantage of having the Japanese version of the book is that I only have the hook size and the charts to go by. Normally that does me just fine but this took a little playing around to get the right results. Very happy in the end though. I love these - so pretty! 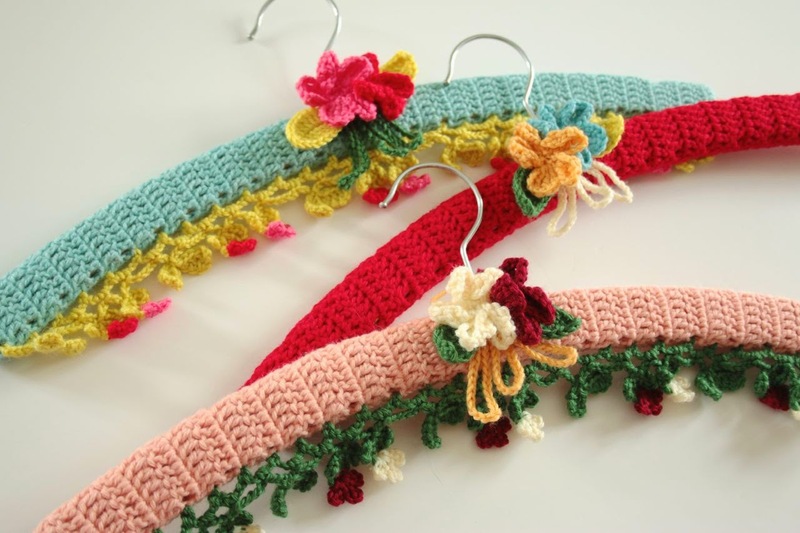 lovely, I have made some hangers too. I am about half way through my Loupy Lou right now. I realized I should be using a bigger crochet hook so am now crocheting in a very loose manner! I am inspired. Thanks for sharing. I am well aware of those lists you allude to. I am a chronic list maker. 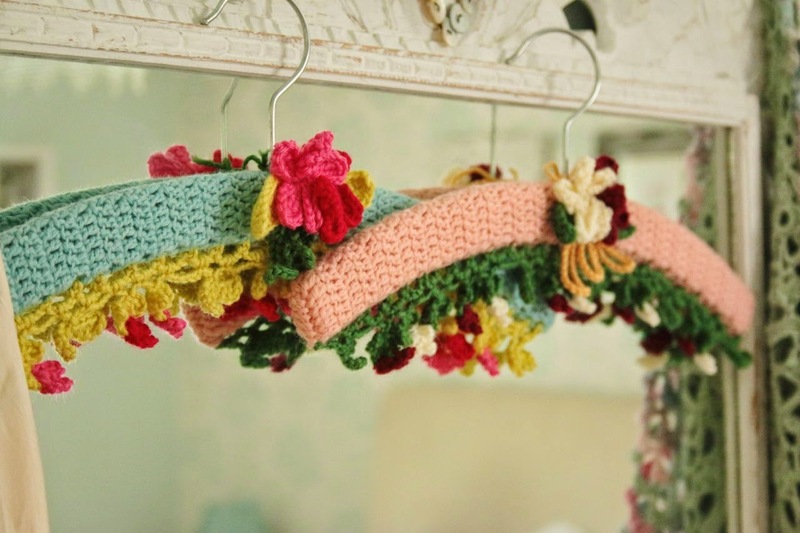 I love the vintage look of these hangars and the fact that they use up bits of yarn. And I am especially glad the book is available in English. I love these covered hangers, especially the Vintage Shell design. So pretty. I'm sure the right hangers are so important and you found them. Clever you! Beautiful! I have these books as well and I want to make them whenever I find the time. Thanks for figuring out the yarn for us! Such pretty hangers. They would do any closet proud. 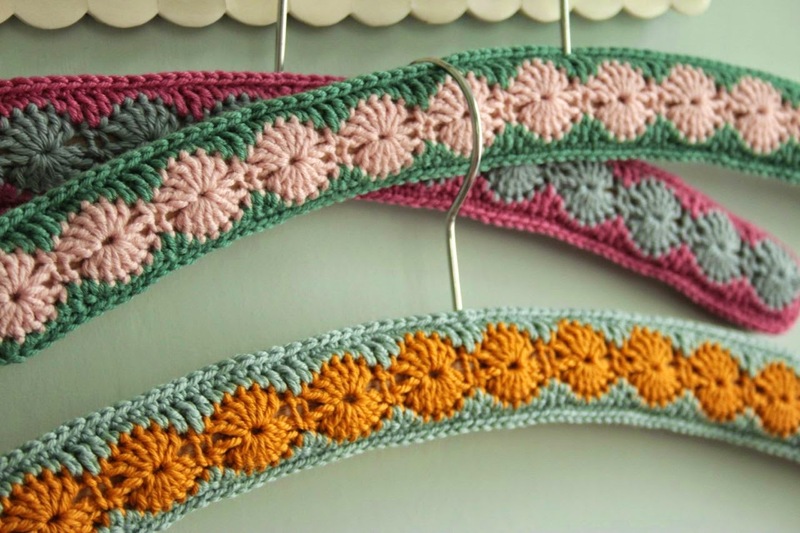 I also have intentions to one day make some crocheted hangers! Definitely on the list. Anyways, your hangers look really nice! Lovely! And such a great way to use up odds and ends of yarn. 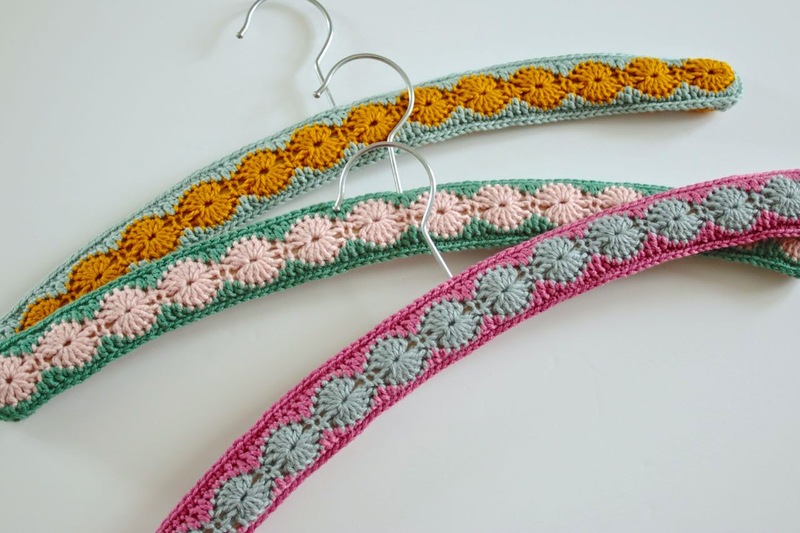 I have some old vintage hangers in this shape that were my mum's when she went to college in the 1950s, so I may have to do them up!! Ooo! These little beauties make me so excited! I love the way you put the colours together. Such a clever little cookie! These are now on my list too. Thank you Sandra. Sandra, how sweet are these? Just darling. I could see these all lined up in a closet. These hangers are just so lovely. Gorgeous Sandra!! Love them :) My husbands' grandmother made some for us over 34 yrs ago, and they are my favorite hangers! Hi Sandra, I often read your blog but this might be the first time I've actually left a comment! I just wanted to say how inspiring you are, I love all of your makes and in fact I'm working on a granny blanket that you created a while back, inspired by your natural flair for gorgeous colours. Your hangers are fab, and Ive often wondered where you might find those old vintage sorts, charity shop hunts failed dismally but thanks to you, I now know what Im meant to be looking for. Hi Sandra, the hangers look like good fun to make. Love the vintage shell hangers too. I have this book (the English version) too and it has some great projects, I've just done a couple of motifs from the honeycomb blanket pattern, struggling with colour scheme at the moment though. Oh so pretty... and yes,they are on my list too! Maybe I should bump them up the list after seeing these pretties. What a stylish wardrobe you shall have! Oh how wonderful that you still have some original ones from your husbands grandmother, treasures indeed!